Sign up for the HAS Advantage Refer-a-Friend program and earn bonus points! With every approved referral, you and your friend both receive bonus points. There is no limit to the number of points you can earn so register now. Terms & Conditions: Bonus points are contingent on cardmember first purchase. Most up to date terms, conditions and point offer can be found at www.hasadvantage.com/refer-a-friend. HAS reserves the right to update offers at any time. Point insertion can take up to twelve weeks from first purchase. Every approved signature and platinum referral is 2,000 points. 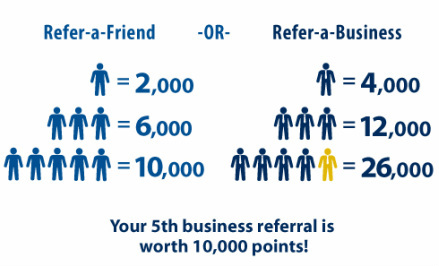 Approved referrals to the business card are 4,000 points, every 5th approved Business referral is 10,000 points. Should U.S. Bank determine that the referral bonus’ you receive constitute reportable income, their value will be reported to you and the IRS on form 1099. You are responsible for any federal or state taxes owed on referral bonus’. Consult your tax adviser should you have questions about the taxability of this promotion.